In the morning arrive in Kunming, the capital city of Yunnan Province, you will be transferred to hotel for breakfast and a short rest. Then drive to visit the Stone Forest (Shilin in Chinese, 89 km, 1.5 hours ), This 80 hectare site of fantastic limestone formations was created during the Permian Era when the sea covered this area. 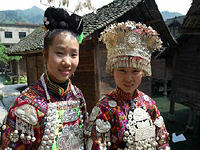 Shilin is on the World Heritage List and managed by the traditional keepers, the Yi people. 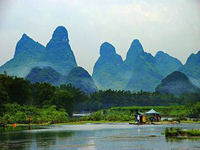 It is famous in China and unique in the world. We will visit the Stone Forest for about 2.5 hours. Today you will taste Yiliang Roast Duck as lunch. Then back to Kunming and have local flavor crossing bridge rice noodle for dinner. In the morning we drive for about 2 hours to Jianshui and visit the 400 year old Chaoyang Tower. 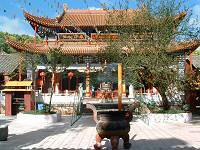 You can also visit the second largest Confucian-temple in China. The small city of Jianshui is the cultural center of southern Yunnan province. In the past, the people of this city became very rich due to the natural deposits of tin. So now, you can see many private houses with typical Chinese architectural style in the city. In the afternoon you will have a chance to visit one of them - the Zhu Family Garden which is formed by 250 rooms and 42 courtyards. Stroll around in the old part of Jianshui Town and see ancient water wells that have been used by local residents for centuries. Thanks to the water quality, a lot of tofu (beancurd) workshops make particularly tasty tofu, and you can see how this popular food is produced in the traditional way. After breakfast we visit Tuanshan Village. Most people in Tuanshan Village are surnamed Zhang. Tuanshan Village exists as the only intact cultural village of the Qing Dynasty that was previously a habitat of the Yi ethnic minority. 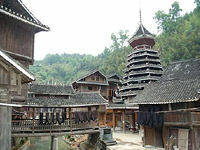 There are also residential complexes built 600 years ago that have preserved the characteristics and environment of the southern Yunnan villages. We then drive to Yuanyang and visit the first wonder in the world: Endless Hani Terrace Rice Fields on the mountains at Laohuzui & Duoyishu. They are popular destinations with photographers due to the vast areas of nearby mountains which have been cultivated into terraced rice paddies for at least the past 1300 years by the Hani people. Drive to Hekou, the China-Vietnam Border port, where you will cross the border in Vietnam. 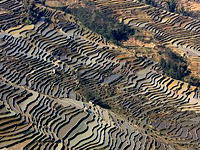 Our Vietnam guide will meet you and drive Sapa & transfer to hotel. Today we take a walking tour to visit Saturday 'mountain market'. Lunch at local restaurant. After lunch we drive to Ta Van village, about 8 km of twisty road from Sapa town. 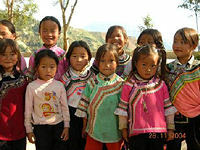 Along the road you will see many H’Mong, Dzay, Dzao ethnic people dressed in their traditional colourful costumes. 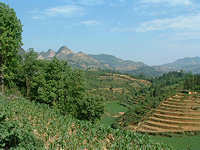 Two-hour walking tour through a terraced paddy field to discover the lifestyle of the Dzay minority. Transfer to Bac Ha. View the wonderful Sunday 'mountain market' full of montagnards from surrounding villages. They dress in their most colourful costumes and head to the market to exchange goods or sell self-made crafts. After lunch, walking tour at Ban Pho village then set off for Lao Cai to board the train for Hanoi. Dinner at local restaurant and overnight on train. Arriving Hanoi in the early morning. Pick up & after breakfast we drive to Hoa Lu, (100 km south of Hanoi), famous as the so-called Dry-Halong Bay: the same limestone rocks as in Halong Bay but lying in rice fields with winding streams instead of the sea. Spectacular scenery during the boat trip to Tam Coc caves. Lunch at local restaurant. Visit Bich Dong Pagoda and Temples of the Dinh and Le dynasties. 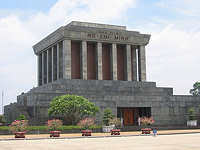 Full day city tour of Hanoi includes Ho Chi Minh’s Mausoleum (closed on Monday, Friday and the whole October-November) and Residence, One-Pillar Pagoda, Army Museum. Lunch at local restaurant. Visit Temple of Literature, built in the 11th century as Vietnam’s first university, Fine Art Museum, Quan Thanh Temple, Hoan Kiem Lake and Ngoc Son Temple in the Old Quarter of Hanoi. In the evening, see the world-famous Vietnamese Water Puppet show in the theatre & dinner at local restaurant. Morning at leisure. 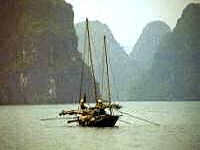 Afternoon about 3 to 4 hours drive to Ha Long Bay. Upon arrival transfer to hotel. Dinner at local restaurant. A morning cruise in a private junk on the emerald green waters of Halong Bay, among the 3,000 spectacular limestone islands. The cruise ends with a fresh seafood lunch on board. Return to Hanoi by road in the afternoon & transfer to hotel. Free at leisure until transfer to airport for your return flight to UK. Arriving Heathrow next morning.